Over the last ten years I’ve seen some things, things you people wouldn’t believe. I’ve travelled across the Middle East and fought my old teacher for my life. I’ve been to Rome and toppled the corrupt pope, been to Turkey and enlisted a league of friends. I’ve then ventured across America and sailed the seven seas, started a revolution in Paris and obtained, through force and guile, territories across the whole of London town. But now after a short break I’m going back to where it all began, back to the beginning of the Assassin’s Creed. I’ve loved this franchise from the very beginning; the adventure, fighting, parkour and the historical detail. Yes, Assassin’s Creed has at times lagged a bit, and it very nearly grew old and a tad stale, but you can’t forget the amazing moments and jaw dropping set pieces that is has delivered over the years. 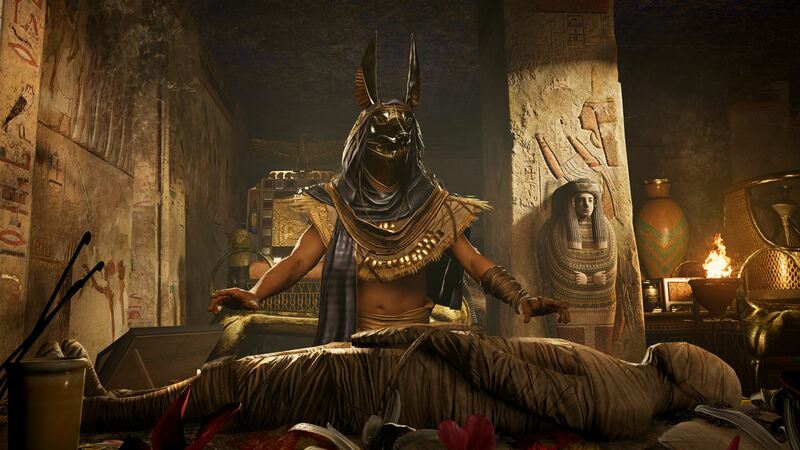 Assassin’s Creed Origins is set in Egypt, at around 50 BC and puts you in the main role (at least for some of it) of Bayek, a man on a revenge mission. We see his story unfold over the course of the game. Bayek lives in the small village of Siwa and is the local Medjay, which is a sort of protector of the village – a sheriff if you like. 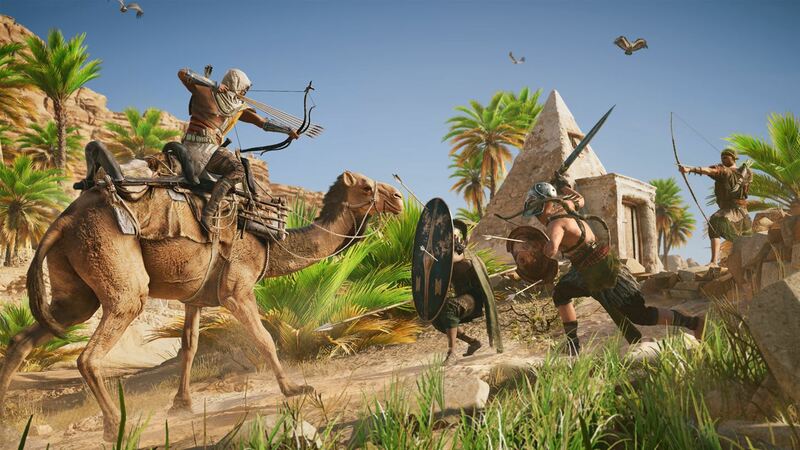 Well, Bayek soon tries to root out the local corruption and evil that inflicted a personal tragedy on him, which soon takes him away from his village to larger locations like Alexandria, the pyramids and beyond. On his journey many secret areas are revealed, many side quests are taken upon and you find him rubbing shoulders with famous historical characters like Cleopatra and Julius Caesar. The instinctive game mechanics that have always been present in the Assassin’s Creed titles are still the same with Origins, but now the parkour climbing mechanic has been honed to perfection. What it does do differently is with the combat and the new RPG-style system of gaining skills and knowledge. The combat is harder and has a new system for controlling the action – to start with you have a light attack, a heavy attack, a shielding defensive move and a dodge. The enemies have their health bars and level above their heads, but as they move towards you, you have decisions to make. If they are way higher than you in level, my advice will be to run or try to take them out with ranged combat. You have a lovely bow and arrow attack available to you, which works very well indeed and is very effective, adding a new battle option for you to approach any given situation. You also have a special attack, should you action enough combos in order to fill it. This is a hugely over-powered attack that gets better as you level up. It all allows for Origins to bring a much more tactical approach to combat. The RPG levelling up system meanwhile is the new kid on the block. The big change here is found in the Destiny style looting and buying of special weapons. You’ll find that many have legendary status and additional features like being fire resistant, or good for heavy attacks. Upgrading and customisation of weapons is a big thing, as is hunting down special treasures as you sit back in the hope for a lucky drop. Whether you enjoy this system or not will fully depend on your level of addictiveness – mine is high. You see, as you progress through the levels you get ability points as well, that open up an RPG tree, full of different skills and treats to buy. Do you get some bombs, or fire bombs, or attack from above or be a smarter negotiator at the shops? There is nothing new here for RPG fans, but for the Assassin’s Creed nutters among you this is a very new device, and I for one love it. It’s fun to customise your abilities, and weapons, gaining skills as you progress through the game. There is also a crafting system that is really easy to use, that involves hunting down creatures and getting their pelts. Those familiar with the older Assassin’s Creed titles will remember about the special sense – Eagle Eye – whereby you could find people/targets and map out your environment. Now you have an actual Eagle of your own called Senu, who with a simple press of a button allows you to view the world through her eyes, picking out things to hunt, and the lay of the land while preparing an attack on special assassination targets. 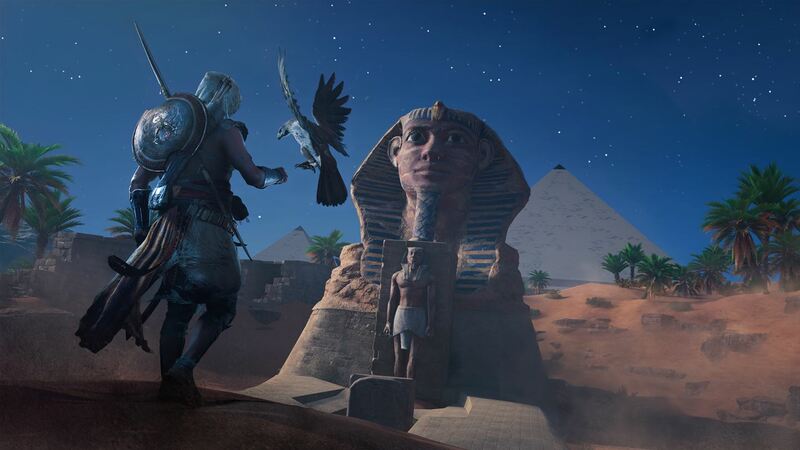 It is, quite frankly, a brilliant addition to the franchise, and Senu is a bird who you’ll grow very fond of indeed. Speaking of animals you can now travel with a camel across the desert, or you can buy horses and other animal upgrades. There’s quite a bit of fighting with animals too and this is another great feature that I love – especially the fun that can be had with the hippos. With the story and mission structure in place, Origins feels like the best AC title in a long time. There are many main missions which tell an epic story and place you in a myriad of different locations and situations, whilst the side missions are also very well conceived and designed, both interesting and well written. There is an amazing open world map, which comes with secret locations, tombs, climbing points, hidden items, standing stones and many more beautiful points of interest. 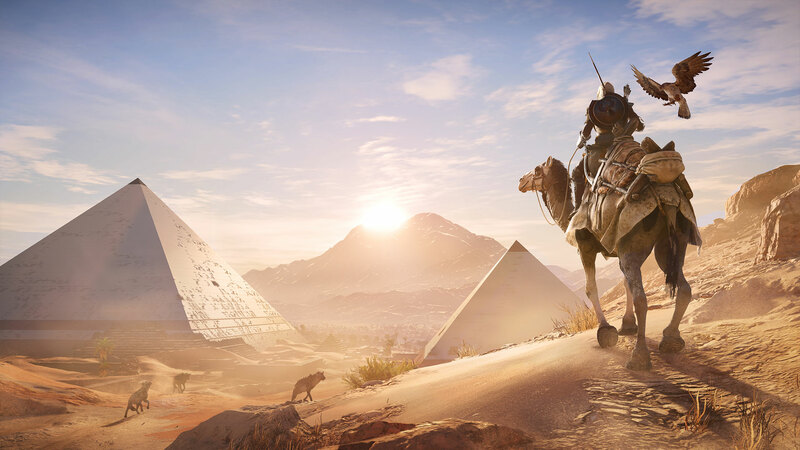 If you like your open world games, then you’re in for treat here with Assassin’s Creed Origins, and I was so distracted with the many on going options for the first ten hours that I barely got out of the prologue. This is a huge game for you to invest in. The writing and story is good, with some great detail to historical accuracy and characterisation. The main character is both likeable and complex, which is a good thing for an Assassin’s Creed game, and the other side characters are brilliantly created. I really liked the modern day story as well, which twists things around quite a bit, giving a refreshing new lead to the series. But how is it all looking I hear you cry? Pretty, pretty, pretty, good is the short answer. The Egyptian world that has been created is stunning and very diverse in its attention to detail. The outside world has amazing draw distances without the problem of any pop up or problems at all. If you see it, you can go to it, unless it really is the edge of the world. The interiors are very good as well, especially when you go into the palaces, tombs and temples. The attention to detail is right up there with the very best of them with art, design and locations mixing together perfectly. The character design is great, but some of them – away from the main characters – aren’t quite as stunning as I would have liked. There can also occasionally be a bit of stuttering in the built up areas, but it’s never anything too annoying. The animals are excellent, showcasing lions, birds and even lovely Egyptian cats, who seemed to follow me around all the time. Having this huge mixture of wildlife, all operating in its own diverse ecosystem, makes the world seem truly alive and vibrant. And then we get on to the audio, and this department is full of epic scores, great effects and some excellent voice-over work. The score is the normal standard of movie style music from the Assassin’s Creed team, and it definitely plays on the location and era of the game. The effects make the game seem busy and as real as ever as you progress through the lands. The voice-over work is excellent throughout, from the main character to the random chanting in the streets. If you’ve played any of the other Assassin’s Creed games in the franchise, then stop reading this and buy Origins right now. If you’ve always been curious about playing, and want to try an action adventure, with RPG elements, or feel like taking in a great story and beautiful locations (that will look even better with the Xbox One X), then give it a go. I love this series and I make no excuse for being a fan. Now excuse me while I get back on my camel and carry on my epic adventure.